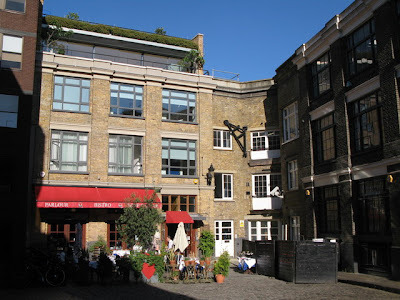 Yesterday evening, your author ate with friends at the Bleeding Heart Bistro, on Bleeding Heart Yard, and whilst it was a bit like eating in the nineties, the food was decent enough and it wasn't that expensive, though the wine was pretty pricey. As regular readers and most with an interest in London will know, Bleeding Heart Yard takes its name from Lady Elizabeth Hatton, who following a Winter Ball was found torn limb from limb in the yard with her still beating heart pumping blood out onto the cobblestones. The bistro is rather less interesting than the legend, but is pleasant enough, with staff who pretend to want to speak to you in French but then aren't up for following it through, and overblown French wine posters the name of the game.